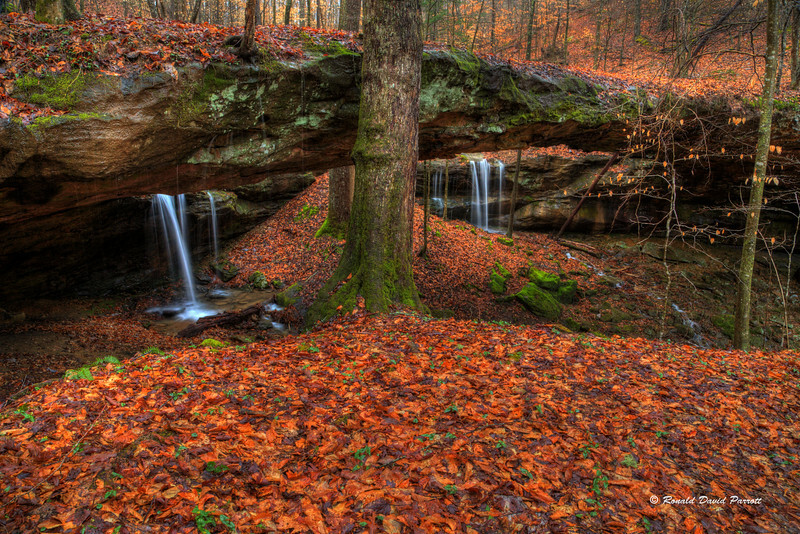 This is Fishtrap Bridge in the Daniel Boone National Forest in Laurel County, Kentucky. The two waterfalls here are on intermittent streams which are often dry. It was raining and near the end of the day when I took this photo. The conditions were almost perfect for saturated colors, and maximum water flow. A lot of the waterways and primitive roads in this area were flooded on this day. So I had a little more adventure than usual. Hawk Creek was moving swiftly, and the water depth averaged about 15 inches over the low lying concrete bridge on my route. First I determined that I could walk across the bridge while using my tripod as a sturdy walking stick, and then I managed to safely drive across. The next road on my route was a dirt road which was full of deep ruts and very large puddles. Many of the puddles were about as wide as the road, and much longer than my vehicle. I stopped often to wade into the edge of the puddles with my knee high muck boots. Then I probed the depths with my tripod to determine which edge of the road I should drive on. At times I sank into the mud so much my boots almost became stuck. Regardless, I was usually able to proceed without incident in my high clearance 4 wheel drive vehicle. The largest body of water in the road was more of a challenge than I was willing to attempt without a snorkel. I saw where ATVs had bypassed that troublesome spot by going down a slope and then going up very a steep hill to get back to the road. It was so slick I didn't know if I could get back up the other side without putting on my tire chains. I locked my rear differential, gave it a try and started spinning. Then I put on my tire chains, and proceeded without any problem. On the way back I wasn't too concerned about that little detour. It wasn't as steep going up the other side, and I still had my tire chains installed. However, the road was tilted in such a way that my vehicle started to slide sideways towards the nearby trees. I quickly backed up to the point on my detour which was the closest to being level. Then I rapidly drove along the high side of my detour route. Forward momentum prevailed over sideways tugging gravity. I love it when physics is on my side. Fun times!